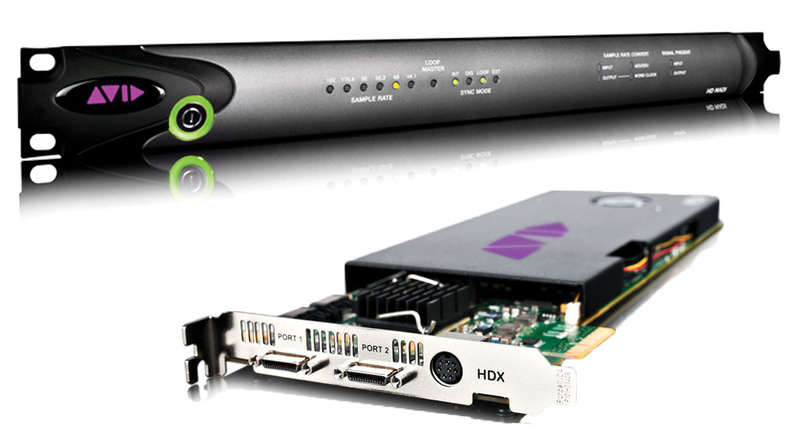 The move from HD to HDX marks a leap into the unknown for high-end Pro Tools users. What exactly does Avid's new DSP platform offer? Avid's new Pro Tools HDX card has twice as many DSPs as previous-generation HD cards, offering five times the performance. When Avid were taxed to devise a name for the company's new Pro Tools DSP hardware, they did what any self-respecting company does these days: added an X. Pro Tools HDX, the long-anticipated successor to Pro Tools HD, was launched at last October's AES show and represents both a major change and a major step forward for the Pro Tools platform. It's perhaps interesting to consider that Avid — née Digidesign — have never before had to conduct a Pro Tools transition on the scale of HD to HDX. Whereas Pro Tools Mix, the predecessor to HD, had been available for a mere four years before HD was launched, HD has now been on the shelves for about 10 years and presumably has a considerably larger user base as a consequence. What's particularly noteworthy about the 10-year figure is that Pro Tools itself has only existed for about 20 years; so HD represents half of the product's lifespan so far. Given that there are so many HD users, one might have expected Avid to ensure a somewhat favonian transition to the newer platform, but this hasn't quite been the case. For example, where the original 192 I/O interfaces launched with HD at least offered 'Legacy Peripheral' ports, enabling Mix-era interfaces to be initially incorporated into the newer system, the latest HD I/O interfaces, launched by Avid in 2010, do not have such a provision. And there's no mention of the older blue/silver interfaces in the HDX Install Guide, which is perhaps unsurprising since, as mentioned last month, Avid have already announced that Pro Tools 10 will be the last "feature release” to support HD-era hardware. Still, as companies like Apple have proved time and again, sometimes it's necessary to break with the past — no matter the potential inconvenience for existing users — in order to make significant progress. The big question, of course, is whether or not HDX represents significant enough progress to keep existing users grazing in the Avid fold. The System Usage window for a single-card HDX system running a light session. Notice how the meter for each DSP now shows how many instances of a plug-in are running on that chip. These limitations are understandable, in a sense, especially since HDX is obviously a major platform shift for Avid, occurring at a time when the host platforms themselves are also shifting. While Snow Leopard compatibility in Pro Tools 10 was helpful, upgrading to the latest version of an operating system for Mac users is usually unavoidable at some point — particularly since new Macs always come pre-installed with Apple's latest (but not necessarily greatest) operating system release. It seems a shame Windows users will have to wait to join the HDX party, though. As well as only supporting OS X Lion, Avid state that only Mac Pros featuring Nehalem and Westmere processors meet the requirements for HDX cards. If you bought a new Mac Pro after March 2009, you should be fine; but those with earlier models will need to factor a new machine into the cost of the upgrade. Installing an HDX card in a recent Mac Pro is relatively simple, although I do wish Apple could have allowed a little more breathing room for those trying to insert full-length PCIe cards into the bowels of the machine. Unlike previous Pro Tools cards — and, indeed, most audio cards — HDX cards require an auxiliary power source, since the PCI bus doesn't provide sufficient juice to satiate their needs. However, if the notion of auxiliary power conjures up images of dilithium crystals, fear not: Avid include internal PCIe power cables that connect from your computer's motherboard (or its power supply, for non-Mac computers) to the HDX card, to supply the necessary power. On a Mac Pro, there are two auxiliary power connectors on the motherboard, located just behind the graphics card, labelled 'PCIE AUX A' and 'PCIE AUX B'. It's a good idea to connect the supplied power cable to the motherboard first, before connecting to or inserting the HDX card, since this can be a tiny bit fiddly. One reason why the auxiliary PCIe power connections are located behind the graphics card is that higher-end graphics cards are often the most in need of additional power. For this reason, you should make sure there's at least one free PCIe power connection in your Mac Pro, since the installed graphics hardware may already be using one or both of these connectors. 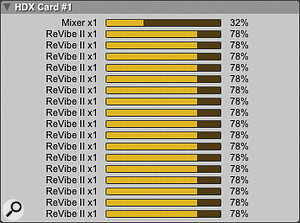 Unlike Accel cards, each DSP on an HDX card has sufficient resources to run a reverb such as ReVibe II. For many years, HD users have had a number of complaints regarding the capabilities of their hardware: not enough inputs and outputs, not enough voices, and, given that the host computers have become so much more powerful in the last 10 years, wouldn't it also be nice to have more power for DSP plug-in processing? Well, I'm pleased to say that HDX fulfils all of these desires. In terms of I/O, an HDX card — like the HD Native card — has two DigiLink Mini ports, to support a maximum of 64 inputs and outputs. And, if you have an expanded system with multiple HDX cards, it's now possible for that system to have a maximum of 256 inputs and outputs. Previously, HD cards were limited to 32 channels of I/O, with 160 channels supported per system. When it comes to voices, the improvement is even more significant. Where HD cards offered 96 voices per card — up to a maximum of 192 voices per system — just one HDX card offers 256 voices, which is the same figure offered by a system with HD Native and the Complete Production Toolkit. However, by using multiple cards, the maximum number of voices available per system is now 768, which is clearly a significant improvement. And, on a more technical level, HDX also triples the number of time slots available on the TDM bus from 512 to 1536, to handle the increased DSP traffic due to higher channel counts. So how did Avid manage to achieve these quantitative improvements? 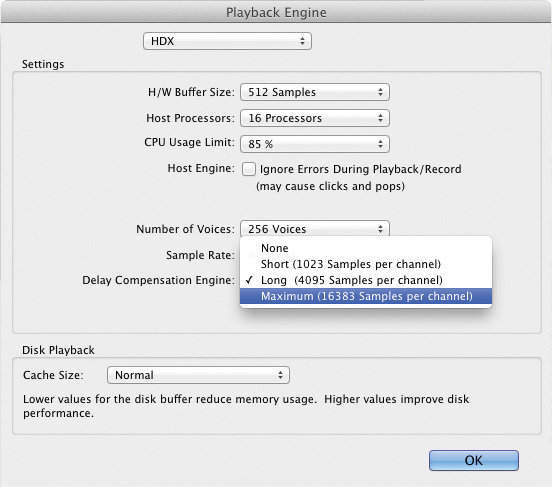 Here you can see HDX selected as the Playback Engine. Note the number of voices, and also the new Maximum Delay Compensation Engine setting. Ever since the introduction of Digidesign's first audio hardware in the '80s, the company has used Motorola's (whose chip division was spun out as Freescale in 2004) range of 56k DSP chips as the foundation for their products. When Pro Tools HD launched 10 years ago, the Core and Process cards each featured nine 100MHz 'Presto' chips, and, for those who are interested, the Presto chip on a recent HD card is an end-of-line version of the 56361 chip. However, a year later, with the launch of the Accel card, Digidesign were able to take advantage of Motorola's latest 56321 chips, which, running at 200MHz, offered approximately 2.2 times the performance. The original PCI Accel cards featured two Presto and seven 56321 chips, but when PCIe versions of the Core and Accel cards were released, both cards were reconfigured to each comprise three Presto and six Accel 56321 chips. Pro Tools HDX breaks with the past in many ways. Firstly, there is no longer the dual-card architecture, where a single Core card is supplemented by additional Accel cards; there are just HDX cards. This is a welcome move, especially for those with multi-card systems, since it means that if the first card in your system should malfunction, you can now just take the defunct card out and carry on working. Secondly, rather than use the latest chip in Freescale's 56k DSP family, Avid's engineers have instead decided to build HDX around Texas Instruments' (TI) range of DSPs. An HDX card offers 18 TI DSP chips running at 350MHz, and given that this is twice the number of DSPs as are found on an HD card, one could humbly assume that HDX would be least twice as powerful. However, Avid claim that a single HDX card actually offers five times the performance of an Accel card, which will certainly be a frisson-inducing improvement for some. There's just one problem: this increase in power is not what you might describe as a free lunch. The instruction sets and architectures of the Freescale and TI families of chips are completely different, and this means that no existing TDM plug-ins will run on HDX hardware. One of the major differences is that whereas the 56k chips used fixed-point processing, the new TI chips use floating-point arithmetic. In terms of resolution, where HD used 24-bit word lengths for plug-in processing and 48-bit for mixing, HDX uses a 32-bit floating-point resolution for plug-ins and a 64-bit floating-point resolution for mixing. This has two important consequences: firstly, it means increased dynamic range for the whole system, making it pretty hard to overload the mixer even when working with a large number of tracks. And secondly, both native and DSP plug-ins are now processed with the same resolution, meaning there can be better uniformity between the sound of native and DSP plug-ins. To deal with this architectural change for plug-ins, Pro Tools 10 introduces the new AAX plug-in format (see box). However, this new sonic uniformity between native and DSP plug-ins poses another challenge for developers, in addition to porting their TDM plug-ins to the new AAX format. In switching from fixed-point arithmetic to floating-point, there's the potential for subtle (and not-so-subtle) sonic differences to occur, so the same plug-in could potentially sound different on HD and HDX. In practice, though, I'm not sure this is going to be as serious an issue as it sounds, since developers have been dealing with creating fixed-point TDM and floating-point RTAS versions of the same plug-ins for many years. Avid have ported many of the company's plug-ins to the AAX DSP format. Here you can see ReVibe, which has become ReVibe II, running on HDX in Pro Tools 10.1. Despite the fact that AAX DSP plug-ins are somewhat thin on the ground at the time of writing, an important question for those considering HDX will concern the benefits of running these new plug-ins on the new HDX hardware. As you would both hope and expect, Avid have ported a number of the plug-ins normally bundled with Pro Tools to the AAX DSP format, and 10.1 installers for many of the company's plug-ins that are sold separately — such as ReVibe, Impact, Smack, and so on — can be downloaded from Avid's web site. One nice aspect to HDX is that opening and closing DSP plug-ins seems much snappier than before, which is possibly why Avid have removed the DSP caching features (which kept TDM plug-ins loaded when closing sessions) from the System Usage window when running on HDX. In other respects, comparing plug-ins running on HD to the same plug-ins running on HDX is a little like comparing plums with pears. Given the architectural differences between the two systems, it's difficult to make relevant technical comparisons in terms of performance. However, given that the technical considerations in this matter are somewhat less important than the real-world implications, it's still useful to have a relative idea of what kind of performance you can expect when mixing with HDX. Taking a simple plug-in like the seven-band version of EQ3, as a stereo, multi-channel plug-in; with HD, a single instance requires 15 percent of one DSP, a second 10 percent (thanks to DSP Sharing), and it is possible to have nine instances running on a single DSP. Using HDX, however, the first instance of EQ3 requires five percent, the second two percent, and it's possible to run 49 instances on a single DSP. Pretty impressive. With the Maxim limiter, the situation is a little different. A single instance on an HD system uses 13 percent, a second nine percent, and you can run 10 instances on a DSP. However, with HDX, a single instance uses 21 percent of a single DSP, a second uses 16 percent, and you can only run five instances on one chip. On the face of it, you might assume that this means HDX is less powerful in some situations. But I think these numbers illustrate the point made earlier, that these plug-ins, while doing the job in terms of audio processing, behave very differently on the different architectures, and HDX more than compensates for such differences by providing twice the number of DSP chips. So where the theoretical maximum number of Maxims on an PCIe Accel card would have been 60, on HDX (assuming one chip is being used to run the mixer) this number is 85. Although Avid have refrained from publishing detailed technical information about HDX, it seems that each DSP now has sufficient memory to run memory-intensive plug-ins. One reason to suppose this is that it is indeed possible to run 17 ReVibe instances on an HDX, with the first DSP running the mixer. And although this is something of an abstract example, in a real-world session it means you'll be able to run a greater number and variety of plug-ins that require a larger buffer than is available on the DSP chip itself. 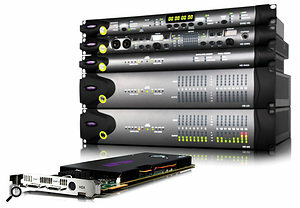 Avid's latest range of interfaces, such as the HD MADI shown here, do not have any means of connecting 'legacy' HD interfaces. In last month's Pro Tools 10 review, I was somewhat critical about Avid's pricing structure for updates, especially for existing HD users. However, when you consider HDX in terms of value for money, it seems as though Avid are playing a very different game. 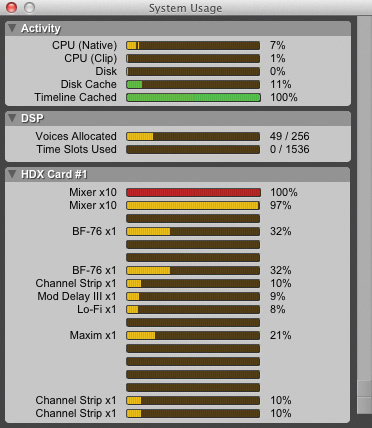 With a single HDX card, using Avid's numbers, you basically get the equivalent horse power of an HD5 system (one HD Core card, plus four HD Accel cards), along with 64 more voices than would have been available on that older system. The only limitation is that an HD5 system could accommodate 160 inputs and outputs, where a single HDX card offers only 64. However, whereas the base HDX systems with a single card start at £7589$9999, an HD5 system would have cost at least double, without even taking into account the cost and hassle of an expansion chassis. So that's definitely progress of a sort. Now, you might be wondering why a hardware-assisted workstation like Pro Tools is even worth considering these days; computers have, after all, become significantly more powerful in the last 10 years since the release of HD. While it's true that completely native-based systems can handle a great deal, I still think there's something beneficial about the deterministic nature of a hardware DSP system versus a completely native approach. And even though the native-vs-DSP argument has clearly become less relevant, Pro Tools still stands as one of the few systems that can offer the user the best of both worlds, especially when required to handle large amounts of I/O. Perhaps the biggest concern with Pro Tools HDX right now is that its success arguably lies in the hands of Avid's third-party plug-in developers. For the system to reach its potential, there really needs to be AAX DSP versions of pretty much every plug-in currently used in the HD TDM environment. Avid have at least made a start in porting their own plug-ins to the platform, although it's a shame that the bundled AIR effects introduced with Pro Tools 8 haven't yet made the leap to AAX, since that would have significantly expanded the salad of out-of-the-box, DSP-capable plug-ins. In a slightly ironic way, the lack of DSP plug-ins available for HDX is slightly compensated for by the increased number of voices offered by the platform — the irony being that to run more native plug-ins, you need to buy more DSP cards to boost the voice count. However, if you're able to minimise the number of trips your audio signals need to make to and from the HDX hardware, and thus the number of voices consumed, you may find the number of cards dictated by your I/O requirements to be sufficient. Combined with the improvements in Pro Tools 10, HDX is an incredibly capable system that should satisfy the increasing demands of existing users. It will be especially welcomed by those working in post-production, where having too many tracks, voices, inputs and outputs is simply never a problem. There are still some issues to be resolved, as indicated by the litany of known problems in the 10.1 'Read Me'; but HDX is ultimately a significant and worthwhile evolution for Pro Tools. Here's to the next 10 years. Pro Tools 10 introduces a new plug-in format known as AAX, for Avid Audio Extensions. And while you might think that the notion of a new plug-in format in the world of music and audio software is something that is needed like a pair of Speedos in the Antarctic, for Avid, this move makes quite a bit of sense. Given that HDX eschews much of the hardware baggage of Pro Tools HD — meaning that existing TDM wouldn't run regardless of the plug-in format — this situation provided an opportunity for Avid's engineers to free themselves from much of the software baggage as well. 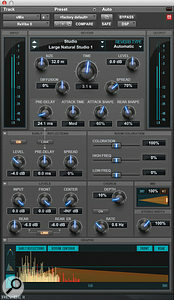 AAX plug-ins come in two flavours: AAX DSP and AAX Native. AAX DSP plug-ins are the replacement for what were previously known as TDM plug-ins, where a plug-in's processing is carried out on the Pro Tools DSP hardware. 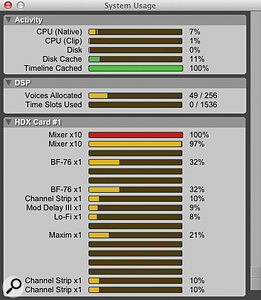 AAX Native plug-ins run on a host computer's CPU and will eventually replace RTAS plug-ins in future versions of Pro Tools. And, in anticipation of a 64-bit version of Pro Tools, Avid have stated that AAX "uses a new SDK [Software Development Kit] that is 64-bit ready”. This consolidation of plug-in formats will ultimately benefit all Pro Tools users, whether you're using HDX hardware or a native system, since AAX makes it easier for native versions of previously DSP-only plug-ins to be developed and made available, and possibly vice versa. Take Avid's ReVibe plug-in, which previously ran only on Accel chips, as an example: with the AAX version of ReVibe II, both Native and DSP version are now provided. This is great for native users who want to use ReVibe, of course, but it will also make session interoperability between native and HDX systems far more seamless than before. The biggest problem with a new plug-in format, however, is that developers are often slow to support it. For third-party developers, this is understandable. Pro Tools 10 on HD or native systems runs existing TDM and RTAS plug-ins fine, and even though HDX systems can't run TDM plug-ins, they can at least run RTAS versions for the time being. Avid have a list of nearly 30 developers on a special AAX compatibility web page who "either have AAX-compatible plug-ins ready or will have them ready shortly”, and this list includes companies such as Eventide, FabFilter, iZotope, Massenberg Labs, McDSP, Sonnox and Sound Toys. Conspicuously absent are Waves, who have yet to make an official announcement, but have made some reassuring noises that AAX support is to be expected. One of the new features in Pro Tools 10 is an increased buffer size for delay compensation. In addition to the Short and Long settings available in previous versions, Pro Tools has a new Maximum setting (I would have paid real money for that setting to be called 'Longer') that quadruples the per-track delay compensation buffer. This means you get 16383 samples at 44.1/48 kHz, 32767 samples at 88.2/96 kHz, and 65534 samples at 176.4/192 kHz. All Pro Tools users get this benefit, except those with Pro Tools HD hardware. Avid state that this is "due to certain limitations with TDM hardware”, which presumably is due to the older cards not having enough memory to accommodate the larger buffer sizes. 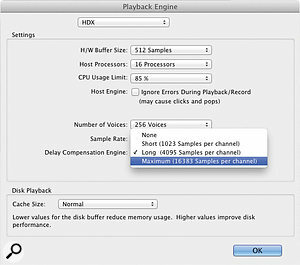 A further benefit for HDX users with delay compensation in 10.1 is that changing the Delay Compensation Engine option in the Playback Engine window no longer requires the current session to be reloaded, which is a rather pleasant convenience. When I tortured this feature with Homer Simpson-esque fascination (delay compensation turns on, delay compensation turns off, delay compensation turns on...), there was one occasion when delay compensation wasn't re-enabled when switching the Engine option from None to something else, but only one. A small footnote on the subject of delay compensation concerns the latency of HDX plug-ins. Unlike native plug-ins, which add no additional latency (so long as they can carry out their work within a single buffer and with no lookahead required), DSP-based plug-ins do add a latency (usually measured in samples) into the chain. Although the difference is usually infinitesimally small, AAX DSP plug-ins on HDX seemed to require more processing time than the equivalent TDM plug-ins on HD. 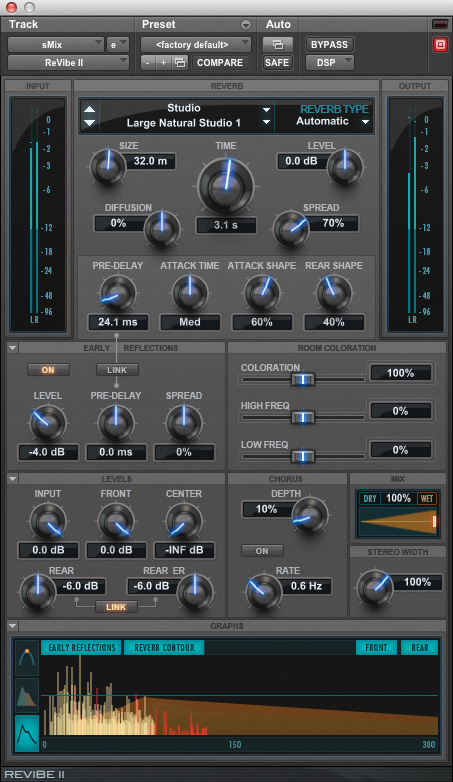 For example, the seven-band EQ3 plug-in adds four samples of latency on HD and seven samples on HDX. The same difference is found on Maxim, which adds 1028 samples of latency on HD and 1031 samples with HDX. (These numbers are so high, incidentally, because according to Avid, Maxim has a 1024-sample lookahead buffer as part of its algorithm.) The most significant example I found was in ReVibe: it has a two-sample latency on HD, but Revibe II on HDX requires 31 samples to do its job. I'm not sure these differences are that significant, but may be something to bear in mind when making comparisons between systems, or moving projects from HD to HDX. Offers a significant improvement over HD in terms of increased power, I/O and voices. A single HDX card is far better value for money than a single HD card, and might be all that some users require. Increased dynamic range for both plug-in processing and mixing, offering better consistency between native and HDX systems. Existing TDM plug-ins are incompatible with HDX, and the current selection of available AAX DSP plug-ins could not be described as comprehensive. Pro Tools 10.1 shows a few minor teething troubles. Pro Tools HDX is a powerful digital audio workstation which continues to combine the benefits of hardware and software within a single, streamlined system. Despite a few rough edges, and the need for third-party developers to truly embrace the new architecture, Avid have clearly set a standard for the next 10 years of Pro Tools. HDX systems from £7588.80. Prices include VAT. Upgrades from HD available. Avid UK +44 (0)1753 655999. HDX systems from $9999. Upgrades from HD available. Avid +1 650 731 6300. Pro Tools HDX card with an HD Omni interface. Apple Mac Pro with dual 2.93GHz quad-core Intel Xeon processors and 16GB memory, running Max OS 10.7.3.